A self-catering cottage with all year BBQ house. Beautiful Irish Country Views. This property is a stunning self-catering cottage decorated to the highest specification. Tullyvar Cottage has been graded by the Northern Ireland Tourist Board as a 5 star property. It is located between Ballygawley and Aughnacloy with fabulous mountain views. This is a perfect luxurious country retreat for both a romantic long weekend or a longer family holiday. There are numerous forest walks nearby and an abundance of historical sites of interest in close proximity to the cottage. Several pubs and great restaurants are available locally in both Ballygawley and Aughnacloy. Golf is available in a number of nearby golf clubs and both coarse fishing and trout fishing can be experienced within a few miles from the cottage. A luxury BBQ House is provided on a raised garden at the rear of the property. A large table with 10 cushioned seats is situated by the BBQ House. The jacuzzi is a corner jacuzzi style bath located in the main bathroom upstairs. Great stay but house in need of updating and maintenance. The property had clearly been built to a high specification and is an excellent space for large groups, however the property has clearly not been maintained since it’s construction and is now looking tired and in some areas, a little shabby. The pictures on the profile no longer accurately represent the house today! The jacuzzi shower no longer works, paint is peeling from the exterior walls, the patio is crumbling dangerously, there were no replacement light bulbs, furniture coverings were peeling off. In addition, although bedrooms and bathrooms were clean, the kitchen was not and we had to clean the kitchen cupboards down as they were sticky. House windows were a disgrace and had clearly not been cleaned for some time. We cleaned off large amounts of bird mess from nests above the windows. Although none of this impinged on the enjoyment of our holiday, I feel it is only fair that you know that the house is no longer as it appears on the current photos. Thank you for your somewhat negative review. Firstly can I say that the house itself does not have paint on the outside but coloured plaster sonir is impossible for this to be flaking off. The garage which is nit part of the property you hired is painted and agreed it needs repainted. The jacuzzi bath no longer exists and has now been replace by a new stand up shower. The bird mess is caused by an annual visit by house martins and I can’t knock down the nests during the summer. The house is vleanddd thoroughly after each visit and I will take on board your comments about the cupboards and pass to my cleaner. Had I been told about requiring a light bulb I would have happily provided one. We wanted accommodation not to far from Belfast to celebrate my husband 60th and Tullyvar Cottage ticked all the boxes. I found the layout and facilities excellent. There were 10 of us + 3 dogs and a toddler very spacious accommodation and very clean. Loved the hot tub and so enjoyed us all sitting at the large dining table for our meals. Weather was great so a bonus. Our thanks to Mel we hope to be back in the near future. Thanks for the very positive review and lovely comments and im glad to hear you had a great time. The weather was fantastic which always helps. I hope to see you back at Tullyvar Cottage again soon. Lovely large, well-maintained property close to Ballygawley which has all the essentials - shops, bars, bank etc. There were six of us but due to the layout and size of the house all could do their own thing. Really large kitchen with really big cooker and full sized fridge freezer. Barbecue hut very impressive! Easy access and parking too. All in all a superb holiday house with all the facilities you could need. Although we did not need them there was a high chair and a high quality sull size cot so would be great for those with a baby. Lots to do in surrounding areas and were lucky enough to visit the Giant's causeway and Rope Bridge on a beautifully sunny day. Would certainly recommend a holiday in this part of Ireland and in particular Tullyvar Cottage !! I have stayed at Tullyvar Cottage on a number of occasions and always find it to be an extremely relaxing and luxurious experience. The cottage is beautiful and deceptively spacious and has everything you could wish for to make your stay extra comfortable. The jacuzzi bath is fabulous. The barbecue hut is a fun and unique experience and suitable for use in all weathers. There is lots to visit in the surrounding areas for both children and adults (e.g. from boutique shops at the Linen Green, an adventure day atTodds Leap, time out at Lavender Spa, Monaghan town, Enniskillen, authentic French cooking at Ardbeg House restaurant). I can't recommend a stay at the cottage highly enough and I am already looking forward to my next visit! booked this cottage for 4 of us over new year and had a fantastic time. this really is a stunning property and could accomodate for a much larger party if required. it is as impressive inside as it is out and it really is a home from home with everthing you need to keep you entertained. i would strongly recommend this to anyone. hope you enjoy as much as i did. We stayed in this property in November 2008 and were very impressed both by the setting and by the house itself. It is very spacious and comfortable, has excellent facilities and is fitted out to an extremely high standard - a real touch of luxury. We enjoyed the pleasant walks in the area and exploring the surrounding countryside and will certainly return in summer to take advantage of the outdoor facilities at the property. We would have no hesitation in recommending this property to anyone looking for a relaxing break in high quality accomodation. Tullyvar Cottage is a beautiful property located on a hill with stunning views, and is close to both Ballygawley and Aughnacloy in Co. Tyrone. The property is very accessible to the A4 main link route between Dublin and Derry/Londonderry. 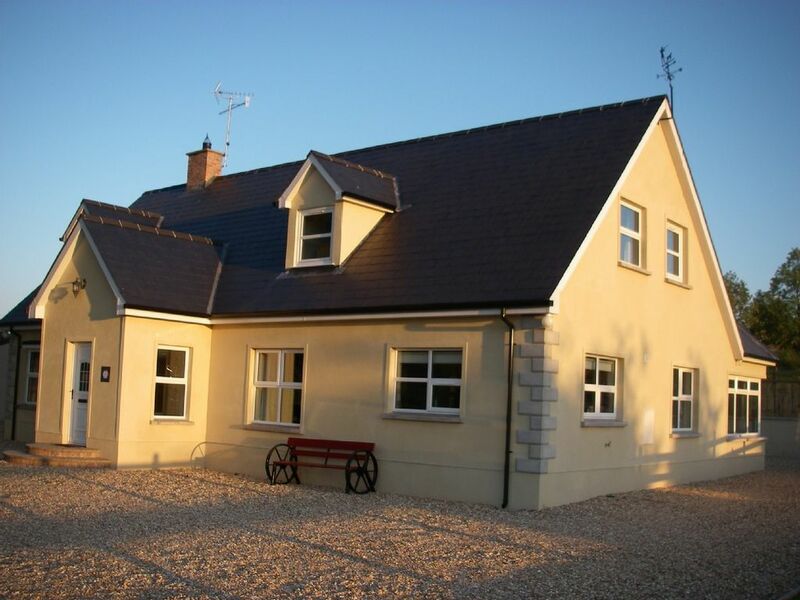 Situated within 3 miles of the border with Co.Monaghan in the South of Ireand the cottage is ideally located for traveling all around the Northern Half of Ireland. Located close to the Ballygawley roundabout the cottage is ideal for use as a base for traveling throughout Ireland and is accessible to the Ulster American Folk Park (Omagh), President Grant Homestead ( Near Dungannon), Fermanagh Lakes and Enniskillen, the Sperrin mountains (Gortin) and Armagh Cathedral and Planetarium (Armagh) within a half hour drive. Belfast is only 1 hour drive east, Londonderry and the North Coast is 1 hour North while Dublin is 1hour 45mins south. Other Activities: Shooting trips can be organised, off road jeep driving, archery, paint balling, clay pigeon shooting, arts and crafts and lavender health spa.